Sing a joyful noise unto the Lord with twenty-eight gospel-style psalms and canticles for the entire liturgical year. "After the first reading comes the responsorial Psalm, which," the Church tells us, "is an integral part of the Liturgy of the Word and holds great liturgical and pastoral importance, because it fosters meditation on the word of God. The entire congregation takes part by singing the response " —(General Instruction of the Roman Missal, Third Typical Edition). 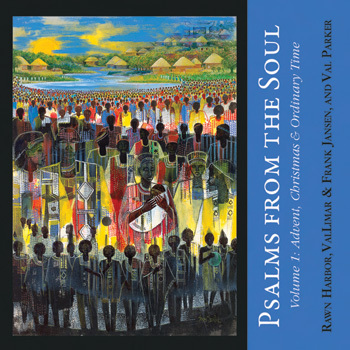 Introducing Psalms from the Soul, the first psalmody collection designed for all who love gospel music. Providing 28 gospel-style psalms and canticles with verbatim texts from the Lectionary, it features new music by some of todays best-known gospel composers. Psalms from the Soul looks as good as it sounds. The songbooks and CDs feature Outdooring, a colorful original painting by Sami Bentil. A native of Ghana, he produces art that blends the history of that nation with his passionate vision of world peace. More information is available at samibentilart.com. After the first reading comes the responsorial Psalm, which, the Church tells us, is an integral part of the Liturgy of the Word and holds great liturgical and pastoral importance, because it fosters meditation on the word of God. The entire congregation takes part by singing the response (General Instruction of the Roman Missal, Third Typical Edition). Psalms for the Soul provides an essentially Catholic approach to psalmody in true gospel style. Written by gospel musicians for gospel musicians -- and all who love this spirited music -- these dynamic settings will help assemblies around the U.S. sing the response to Gods word with heartfelt zeal and authenticity. "After the first reading comes the responsorial Psalm, which," the Church tells us, "is an integral part of the Liturgy of the Word and holds great liturgical and pastoral importance, because it fosters meditation on the word of God. The entire congregation takes part by singing the response" —(General Instruction of the Roman Missal, Third Typical Edition). The first psalmody collection designed for all who love gospel music, Psalms for the Soul provides 28 gospel-style psalms and canticles with verbatim texts from the Lectionary and features new music by some of today's best-known composers of gospel music. Recorded with an authentic gospel choir, the CDs reveal the full potential of this passionate music. The call-and-response between cantor, choir and assembly along with infectious rhythms and cantor embellishments invite enthusiastic participation from all. Comprehensive and easy-to-use, the accompanying songbooks allow your musicians to reproduce this joyous music. Psalms from the Soul looks as good as it sounds. The songbooks and CDs feature "Outdooring," a colorful original painting by Sami Bentil. A native of Ghana, he produces art that blends the history of that nation with "his passionate vision of world peace." You can find out more about his art at samibentilart.com. Written by gospel musicians for all who love this spirited music, these dynamic settings will help assemblies around the U.S. "sing the response" to God's word with heartfelt zeal and authenticity, all the while providing an essentially Catholic approach to psalmody in a true gospel style. Compare Psalms from the Soul with other psalm resources here.